Have a great stay at the Comfort Suites® hotel in Commerce, GA! This is an award-winning Commerce all-suites hotel near the Atlanta Dragway, Road Atlanta and the Lanier Raceplex. 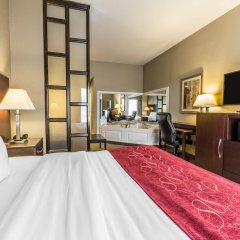 Our convenient location and outstanding service make this smoke-free Commerce family-suite hotel your ideal lodging choice. Shoppers can browse for treasures at the nearby Tanger Outlets Center and Mall of Georgia. While searching for Commerce pet-friendly hotels near the Funopolis Family Fun Center, look no further than the Comfort Suites. Business travelers will appreciate our 75-person meeting room and our business center, which offers copy and fax services and a computer with Internet. For your convenience, guest laundry facilities and valet cleaning services are available for a small fee. We invite you to relax and make yourself at home in your spacious room, which features a microwave, refrigerator, flat-screen TV, coffee maker, desk, hair dryer, iron and ironing board. Keep your electronic devices charged with the recharge device including AC and USB outlets provided in all guest rooms. 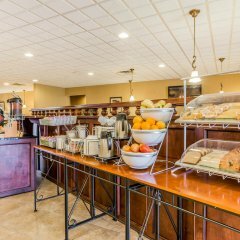 Enjoy the combination of cozy accommodations, friendly service and wonderful amenities at the platinum award-winning Comfort Suites. Book now – we look forward to hosting you soon!